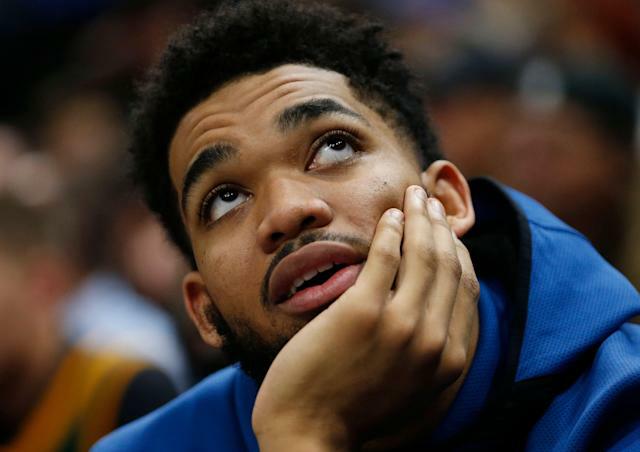 Minnesota Timberwolves star Karl-Anthony Towns missed the first two games of his career on Friday and Saturday, but he had a good reason: he was in a car accident on Thursday, and it was a lot scarier than anyone knew. Towns opened up about the accident for the first time on Monday, telling the media that he’s “blessed to be alive” after the crash, which could have been must worse. Towns and assistant strength coach Kurt Joseph were driving together, and had stopped suddenly due to an accident a few cars up. Towns told reporters that he complained to the trainer about how hard the car in front of them had stopped, but the trainer had his attention focused on the rearview mirror, in which a semi-truck was continuing to drive toward them as if they weren’t stopped. Towns estimated that the truck was traveling at 35-45 mph when it hit them. During his session with the media, Towns said there was a five percent chance he would have survived the crash, and that he’s in the one percent of people who survived without injury. Towns was put into concussion protocol after Thursday’s car accident, ending his 303-game start streak. The Timberwolves announced on Monday that Towns had been removed from concussion protocol and would be available for Monday night’s game against the Sacramento Kings.